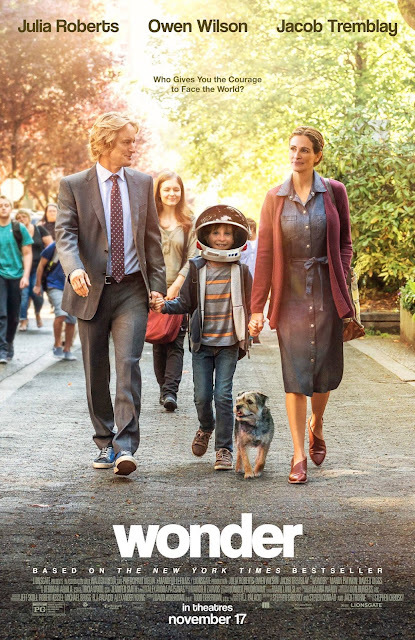 Get ready to meet Auggie Pullman in the movie WONDER. Born with facial differences that, up until now, have prevented him from going to a mainstream school, Auggie becomes the most unlikely of heroes when he enters the local 5th grade. As his family, his new classmates, and the larger community struggle to find their compassion and acceptance, Auggie's extraordinary journey will unite them all and prove you can't blend in when you were born to stand out. Based on the New York Times bestseller, WONDER stars Jacob Tremblay as Auggie. The book has been on my "to read" list for a few years now because everyone that has read it raves about how awesome it is. I love a story that teaches about kindness and being brave and standing out when it would be so much easier to fit in. Have you read the book? Are you super excited for the movie like I am? 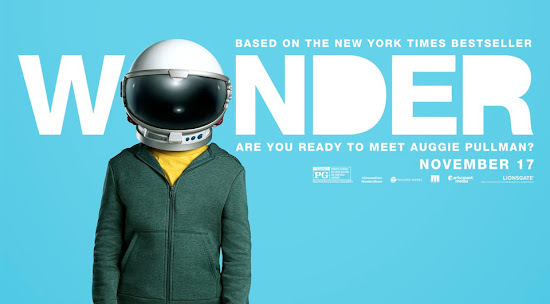 WONDER opens in theaters nationwide Friday, November 17th. Enter using the Rafflecopter widget below, good luck and remember to #ChooseKind! Definitely my kiddos! I can't wait to show them this movie, how inspiring! My kids inspire me to “be a little more kind than necessary”. They are going to need extra kindness in the world they are growing up in. My daughter Hannah! She is always finding a reason to serve, and pushes me our of comfort zone to follow in her steps! I love this book so much and I can’t wait to see the movie! Thanks for having a giveaway! I always like it with others do kind things for me, so I like to do the same for others. My kids inspire me to be kind. My oldest son. He doesn't have a mean bone in his body. I am inspired to be kind by the knowledge that we are all one human family, who are probably trying our best, and who definitely just want to be loved. My sons inspire me to be kind. love love LOVE this book, can’t wait to see the movie! my precious miracle nephew who is our own wonder boy in many ways inspires me to be kind. The whole world inspires me to choose kindness, if only we all would!! My oldest son is incredibly kind and he really inspires me. My family especially my grandkids! My son inspires me to #ChooseKind I want him to choose kind so what better way than to show him how. My kids; I teach them what is right and wrong through emulation. How can I not #ChooseKind? My kids inspire me to be a kind and giving person! This looks like it's going to be a wonderful movie. Being kind to people even if there different is a good message we all should learn from this movie. Thanks!! My children, they always want the best for others. My mom inspired me because she became deaf at a young age and never let it stop her or anyone standing in the way. She taught me to be kind to everyone.